The book is presented in four parts: 1) Introduction to OpR Management, 2) Data for OpR Management, 3) OpR Analytics and 4) OpR Applications and its Integration with other Disciplines. 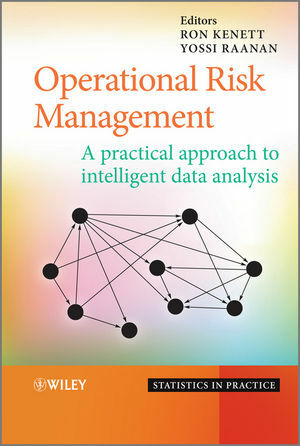 Explores integration of semantic, unstructured textual data, in Operational Risk Management. Provides novel techniques for combining qualitative and quantitative information to assess risks and design mitigation strategies. Presents a comprehensive treatment of "near-misses" data and incidents in Operational Risk Management. Looks at case studies in the financial and industrial sector. Discusses application of ontology engineering to model knowledge used in Operational Risk Management. Many real life examples are presented, mostly based on the MUSING project co-funded by the EU FP6 Information Society Technology Programme. It provides a unique multidisciplinary perspective on the important and evolving topic of Operational Risk Management. The book will be useful to operational risk practitioners, risk managers in banks, hospitals and industry looking for modern approaches to risk management that combine an analysis of structured and unstructured data. The book will also benefit academics interested in research in this field, looking for techniques developed in response to real world problems. Ron S Kenett, Chairman and CEO of KPA Ltd. also Research Professor, University of Turin, Italy and International Professor, NYU School of Engineering, New York, USA. Yossi Raanan, Senior Consultant at KPA Ltd. Also Senior Lecturer, Business School of the College of Management, Academic Studies, Rishon, LeZion, Israel. PART I INTRODUCTION TO OPERATIONAL RISK MANAGEMENT. 1 Risk management: a general view (Ron S. Kenett, Richard Pike and Yossi Raanan). 1.6 State of the art in enterprise risk management. 2 Operational risk management: an overview (Yossi Raanan, Ron S. Kenett and Richard Pike). 2.2 Definitions of operational risk management. 2.3 Operational risk management techniques. 2.4 Operational risk statistical models. 2.5 Operational risk measurement techniques. PART II DATA FOR OPERATIONAL RISK MANAGEMENT AND ITS HANDLING. 3 Ontology-based modelling and reasoning in operational risks (Christian Leibold, Hans-Ulrich Krieger and Marcus Spies). 3.2 Generic and axiomatic ontologies. 4 Semantic analysis of textual input (Horacio Saggion, Thierry Declerck and Kalina Bontcheva). 4.3 The general architecture for text engineering. 5 A case study of ETL for operational risks (Valerio Grossi and Andrea Romei). 5.2 ETL (Extract, Transform and Load). 6 Risk-based testing of web services (Xiaoying Bai and Ron S. Kenett). 6.5 Risk-based adaptive group testing. PART III OPERATIONAL RISK ANALYTICS. 7 Scoring models for operational risks (Paolo Giudici). 8 Bayesian merging and calibration for operational risks (Silvia Figini). 9 Measures of association applied to operational risks (Ron S. Kenett and Silvia Salini). 9.2 The arules R script library. PART IV OPERATIONAL RISK APPLICATIONS AND INTEGRATION WITH OTHER DISCIPLINES. 10 Operational risk management beyond AMA: new ways to quantify non-recorded losses (Giorgio Aprile, Antonio Pippi and Stefano Visinoni). 10.2 Non-recorded losses in a banking context. 10.4 Performing the analysis: a case study. 11 Combining operational risks in financial risk assessment scores (Michael Munsch, Silvia Rohe and Monika Jungemann-Dorner). 11.1 Interrelations between financial risk management and operational risk management. 11.2 Financial rating systems and scoring systems. 11.3 Data management for rating and scoring. 11.4 Use case: business retail ratings for assessment of probabilities of default. 11.5 Use case: quantitative financial ratings and prediction of fraud. 11.6 Use case: money laundering and identification of the beneficial owner. 12 Intelligent regulatory compliance (Marcus Spies, Rolf Gubser and Markus Schacher). 12.1 Introduction to standards and specifications for business governance. 12.2 Specifications for implementing a framework for business governance. 12.3 Operational risk from a BMM/SBVR perspective. 12.4 Intelligent regulatory compliance based on BMM and SBVR. 12.5 Generalization: capturing essential concepts of operational risk in UML and BMM. 13 Democratisation of enterprise risk management (Paolo Lombardi, Salvatore Piscuoglio, Ron S. Kenett, Yossi Raanan and Markus Lankinen). 13.1 Democratisation of advanced risk management services. 13.2 Semantic-based technologies and enterprise-wide risk management. 13.3 An enterprise-wide risk management vision. 13.4 Integrated risk self-assessment: a service to attract customers. 13.5 A real-life example in the telecommunications industry. 14 Operational risks, quality, accidents and incidents (Ron S. Kenett and Yossi Raanan). 14.1 The convergence of risk and quality management. 14.2 Risks and the Taleb quadrants. 14.4 Risks, accidents and incidents. 14.5 Operational risks in the oil and gas industry. 14.6 Operational risks: data management, modelling and decision making.